The reminder needs to be paid three 3 weeks prior to arrival via Payal or direct Bank Deposit once the Hostelworld bookings is made. If you want to book with less than three weeks notice please make the booking or contact us directly. In case of No Show the first night will be charged to the credit card. If there is a reduction in numbers the full amount will be paid for the remainder of the people on the group. There is a security deposit of 150 pesos per person to be given in cash on arrival for loss of bedding, keys or general damage to the hostel and its contents. 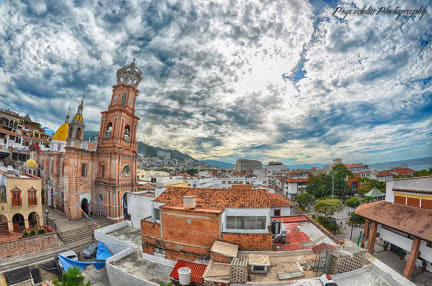 Formerly known as Oasis Downtown Hostel, this is one of the few youth hostels in downtown Puerto Vallarta. We like to see ourselves as a refuge for travelers; a safe, fun, memorable place where life-long friendships develop. Be greeted (with an ice cold beer) by our friendly and helpful staff who also enjoy a good party! So if you want a good time here in Puerto Vallarta, come and join us. Casa Kraken is located in between the church of Our Lady of Guadalupe and the main square (adjacent to the city hall). We are also a block away from the main area of the Malecón: the seahorse statue and the outdoor amphitheater (right next to Los Arcos). In total we have four dorms: we have an eight bed female dorm, two ten bed mixed dorms and a four bed mixed dorm. They all come with fans and ceiling fans. There are also assigned lockers inside the dorms for each guest. The staff members organize some bar crawls, day trips to the beaches and Spanish lessons; feel free to ask for any events! We have a beautiful ocean and city view from our rooftop terrace. You must send confirmation of arrival email two days prior when possible. Check in and check out only between 8 am and 10 pm. 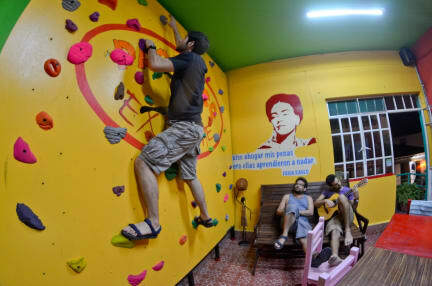 our hostel front desk is only open from 8 am to 10 pm. If you need an extraordinary check in or check out please email us and arrange it. We are not responsible for flight or any kind of delays. Valid national Id is strictly required for check in or loss of reservation will be applied. If you are not a Mexican national only passport applies.